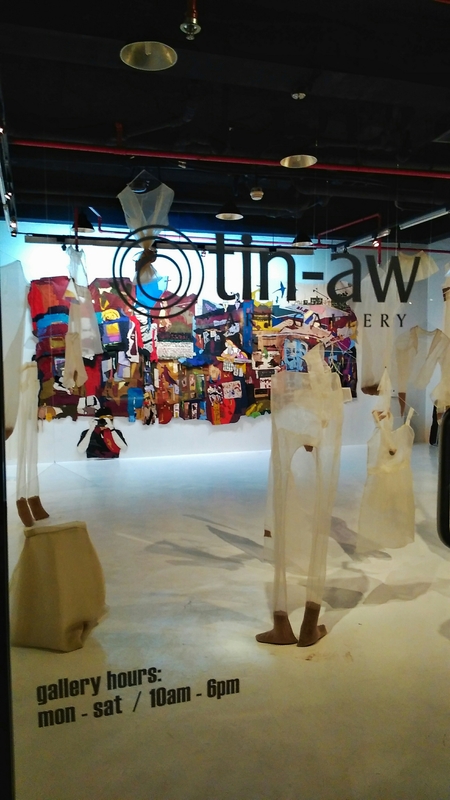 Steph Palallos and Josephine Turalba emphasize the handmade and express personal experience in their upcoming exhibition at Tin-aw Art Gallery. Palallos evokes the vulnerability of the human body by sewing vestments that may be very difficult if not impossible to wear. Made of transparent fabric, her garments avoid the idea of clothing as an object to cloak nakedness, as a means to embellish the human form, or a medium to express desire. Their construction overturns aspects of functionality and fashion in favor of revealing a real but invisible illness that is part of her quotidian identity. The symbolic clothes, all thirty-one of them – one for each day of the month, uncover afflictions that many of us do not want to know let alone see in bodies, including our own. Turalba uses the techniques and materials of leatherwork: studs, rivets, grommets, eyelets, stitchery to lock together images to place and time. Shapes of multi-colored leather, which is metonymic and celebratory of racial difference, form the imagery. The ideas of looking in fragments and capturing transient spaces conceptually frame her work, which is comprised of nine panels that may be grouped as one or as individual pieces, variable to its site. Sourced and inspired from her travels to the non-West, she materializes episodic memory formation into a cornucopia of conjoined images that interlock the formats of landscape, tapestry and collage all at once. “Handmade” opens on 9 November, Monday, 6 pm at Tin-aw Art Gallery located on the upper ground floor of the Somerset Olympia Building on Makati Ave. Makati City. The exhibition runs from 9 – 23 November 2015. I’m glad you get to do this again. I really wish I could see it!